What is an ideal gas? There is a strict relationship between pressure, volume and temperature. Boyles law is assuming that an ideal gas is in use. Boyles law states that at a constant temperature for a fixed mass, the absolute pressure and the volume of a gas are inversely proportional. What is the pressure if the volume is expanded to 5 m³? So we need to find out what P2 is. From the equation P1 x V1 = P2 x V2 we can re-arrange the formula to give us P2. 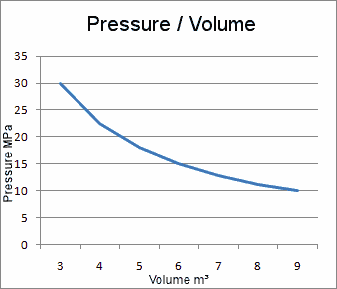 The graph above (fig:1) shows the relationship between pressure and volume under boyles law, if you multiply the pressure and volume together at any single point on the graph you will always end up with the same value. This proves the absolute pressure and the volume of a gas are inversely proportional when using boyles law.